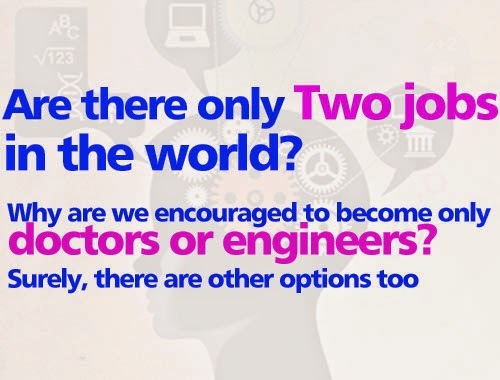 Are there only two jobs in the world? There comes a time in every Nepali’s life when we assume SLC means everything. As in, the SLC results take on a terrible importance. Your marks become the sole basis for people’s judging you. But the percentage on a sheet of paper—which you see digitally first nowadays—can never reveal your true potential. Believe me, we are a lot more than these two digits, and everybody has to find their own way of dealing with the SLC, and then finding their own path. And I am saying that your marks take on this terrible importance because they do change lives. It happened to me; it has happened to others, and it can happen to you. As soon as your results are out, if you scored more than 80 percent in the SLC, you would most likely opt for Science, and if less than 80 percent, probably Management. In our educational system, it’s as if the Humanities were not an even an option. The Humanities don’t even exist for our parents and our so-called teachers who are supposed to counsel us. The magic number—80 percent—has so much power. For if you’ve scored above that cut-off point, you can get the admission forms for streams that you will hope will later land you scholarships in IOM, IOE and MOE: it’s something that you see all the time in advertisement flyers. And obviously everyone is impressed with you, and you are too. It’s not your fault if you then do what you are expected to do—that is, study science—because you are still young, and even the elders around you do not see things with a critical eye. But then, what?? Once you start college, you will start realising that school and college are completely different things. And as your lecturers continue harping on the importance of IOM, IOE and MOE, as if these were the only institutions that mattered in the world, you may be forgiven for thinking that other options just don’t matter at all. In the process, the students who once had creative dreams—the dream to colour their worlds in their own ways—slowly undergo a brainwashing. Truly, in college, I find myself surrounded by robots, for whom anyone’s aspiring to someday become anything other than a doctor or an engineer must only do so on account of programming errors in their heads. And as we become more and more like robots, we start to think that not studying six hours a day and sleeping for more than six hours a day are the biggest mistakes we can make in our lives. The days pass, the indoctrination continues, and the people who cannot keep up fall by the wayside. Many of them turn into backbenchers. But even those who do strive to turn into engineers and so on will soon have to wake up to a reality check. The biggest problem arises when you pass your HSEB board exams and your name does not feature on the scholarship roll. The thing is, your top lecturers never told you that out of those 6,000 or so who were sold admission forms, only something like six people will become the chosen ones. And many of them will still sacrifice yet more valuable time for the sake of taking the same entrance exams. Again and again. Because they have been programmed to be robots. And finally when they realise that they have lost a lot of time, many of them will surely question why their teachers were pushing them towards becoming only doctors or engineers. So, no . I don’t want this type of programmed living and I am totally dissatisfied with our education culture. I do not want a Nepal where everyone who is anyone says, “Hi doc, hello doc, how are you doing doc?” to who is anyone. I want colleges where the students learn to think for themselves. Colleges where the students are encouraged to chase their dreams. A college should be able to hold a mirror to us and allow us to know what our aptitudes and inclinations are: it should be a place where people know that there are other Science streams too, and it should teach students that Management and Humanities are not second options. You, whoever is reading this, can make your own choices. If choosing a career, please choose one that makes you say: “Yes, this is what I am made for.” Realise that society will respect you only if you are satisfied and happy first. I also wish that the colleges put a lot more emphasis on creative thinking and extracurricular activities. And I wish parents from, the very beginning, selflessly guided their children to think about what they want and to understand what aptitudes they have. You must know there are uncountable ways of living. It’s never a compulsion to live what others are living. You can seek what you want.